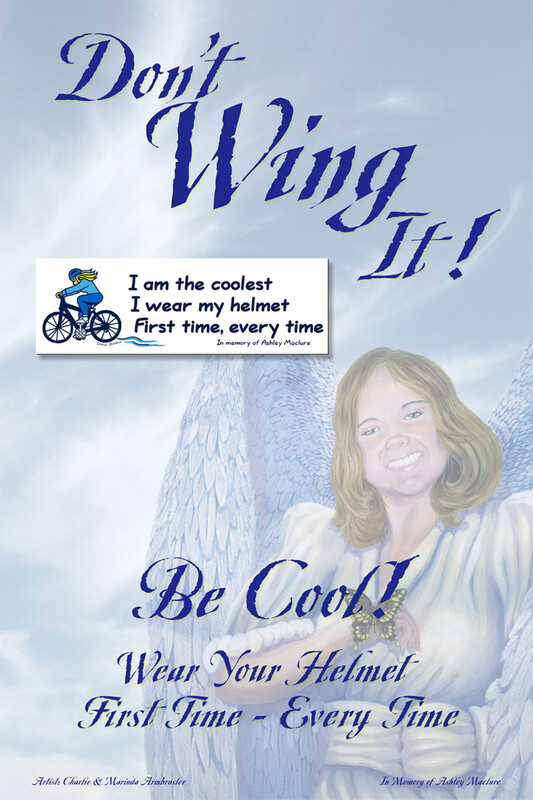 The "poster" below comes from a helmet promotion campaign in Virginia Beach, Virginia. The campaign is the crusade of a mother who lost her daughter in a bicycle crash. This material is copyrighted by Penny Maclure, but she has authorized us to post it for use by any non-profit for helmet promotion. Please contact her by email if you have any questions. Ashley Nicole Maclure was born in Baltimore Maryland on November 27, (Thanksgiving Day). As one of the assignments in her class her sister Jessica was asked to write about what she was most thankful for: Jessica wrote "I am thankful because God is going to send me a baby sister." Sure enough the next Thanksgiving day Ashley was born at 2:52 A.M. Throughout these early years she was in dance, soccer, swimming, and loved to read. Ashley and Jessica were their parents' life. They strived to obtain the best academic and home life possible. Ashley played the violin and that was truly a flop, but she was a trooper and took it in stride. She always said "it's in the genes, even Aunt Judi tried and couldn't play it". Then the teenage years! Like my father used to say, you all were wonderful until you reached puberty and then we couldn't do a darn thing with you. Ashley's Grandpa Jim was a very wise man, and he surely hit this part of life right on the money Then of course there was the phone line we had to put in because we could never get through. That beautiful smile and the glow of those gorgeous blue eyes attracted a great many boys. Ashley was never actually (as she stated) "in love" she was just having fun. She did have fun. The last summer of her young life she had a blast! The warmth of Pensacola Florida all through the month of June was a real treat. The opportunity to get to know her aunts, uncles and cousins, was a wonderful adventure. She became incredibly close to her cousin Matthew as well as the rest of her cousins. They will always treasure this time for the rest of their lives. Then the tragic day: July twenty-second came when Ashley our bright, colorful, beautiful butterfly was hit by a car on her bicycle. She died after three weeks in the intensive care unit She died of a severe head injury because she did not have a helmet on. Her mother held her as she left this world to meet God.